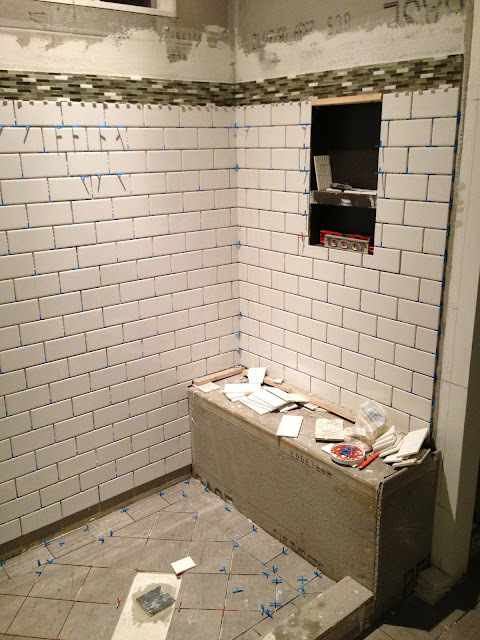 More tiling happened today. The kind of tiling that makes me giddy. The kind that finally allows you to start seeing your vision! Most of the work was done in our new shower and I'm loving it. Let's jump right in! So clean and white! Simple, white, glossy subway tile. I love it. The grout lines are slightly larger than normal because we're grouting with grey to pick up the grey in the floor. 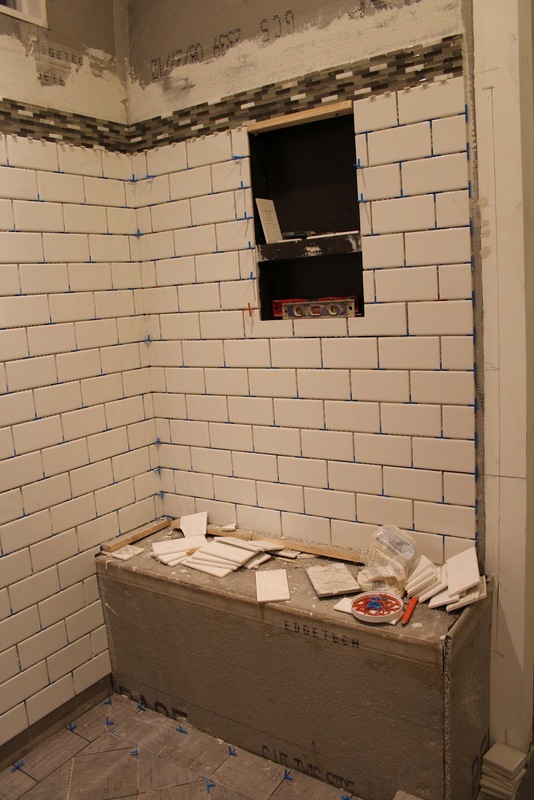 I'm so excited about this part and I can't wait to see the grout go in! This shot really shows how much they did yesterday. I'm not sure what time they arrived, but they worked until 7:30pm to get the shower floor in place as much as it is. There are a million and one separators holding all this good stuff up to dry. Here's a shot of the floor. I am so glad I decided on the border. I think it helps so much. I just didn't like the idea of the diagonal tiles just ending abruptly. Only 2 really complicated cut tiles are left to lay before the floor is complete! Excuse my blurry photography. If you could've seen the position I was in taking this photo, I think I was probably on my way to falling when the shutter clicked. Oops. Our niche is in place. It's very cute and in a great location. It's going to be backed in the mosaic which I think will really give the shower more interest. The bench will be tiled with the floor tiles. I took our paint sample in there to see what it would look like. In the process, we changed our minds! We picked basically the same color, just slightly lighter and slightly cooler of a grey. Wednesday holds more tiling, of course! Our toilet is coming, too! 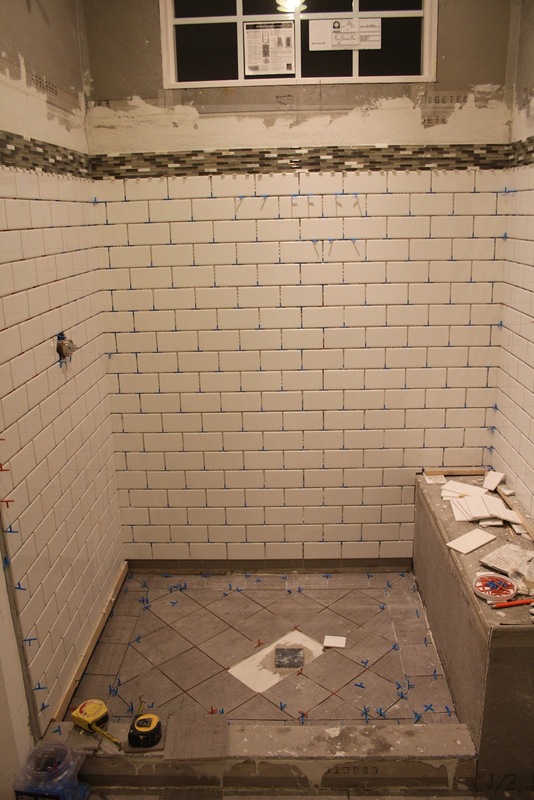 I think they are on schedule to finish tiling by Thursday. Friday we're going to dry fit the vanity, mirrors, and sconces. I really can't wait to see the vanity in place. I think it's going to bring it all together.